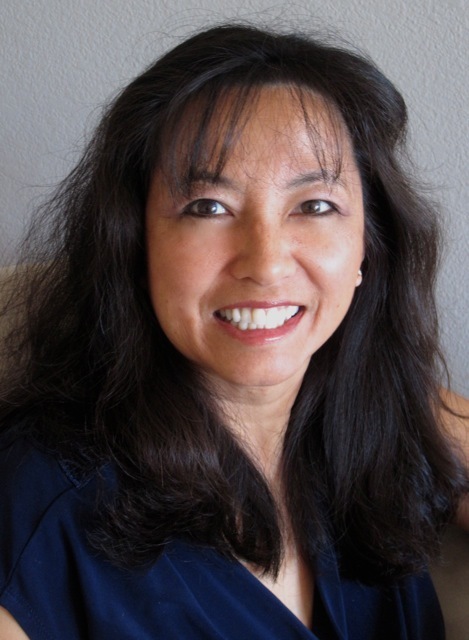 Today I am thrilled to be hosting Natasha Yim on the 4th leg of her blog tour for Sacajawea Of The Shoshone. Let’s jump right into the interview, shall we? It’s a little long (I apologize – but there are extra cinnamon sugary cider donuts to help sustain you :)) I think you’ll find it very interesting, and I didn’t want to break it in two because it would have required an extra post on a non-posting day. Your reward? (Aside from the extra donuts…) If you read to the end you can have some fun and there’s a chance you could win a signed copy of Natasha’s brand new book! SLH: Welcome, Natasha! Thank you so much for joining us today! Can you tell us a little about your writing beginnings? NY: My love of writing began when a 7th grade English teacher gave us an assignment where we had to create our own island and make up names of lakes, mountains, forests, villages etc. and weave a story around it. It was so much fun, I was immediately hooked and I’ve been making up stories ever since. I kept several journals and wrote in them daily. I also kept notebooks where I wrote poems and short stories. My Mom knew of my interest in writing and she was very supportive. She encouraged my creative expression, sometimes reading my stories and offering comments, but mostly just letting me write. SLH: What was your first published children’s book? Tell us about the moment when you got your first offer! NY: Otto’s Rainy Day(Charlesbridge Publishing, 2000). For some reason, Charlesbridge was the only publisher I sent this manuscript to (maybe it was because they wanted exclusive submissions at that time? I can’t remember), but I sent it out and went on to work on other things. The guidelines said they would respond in 3 months. 3 months went by and nothing happened. At the 6 month mark, I received my SASE back. I could feel my heart dropping thinking this was a rejection letter. It wasn’t. The letter said they were really backlogged and hadn’t gotten to my manuscript yet, and to be patient because they will read it—eventually. I remember thinking how nice that was. Usually, you just don’t hear from publishers unless they reject or accept your work. At the 9 month mark, I received a phone call from the editor. I was soooo excited, thinking this was it. This was THE call. It wasn’t. The editor had called to say they were still really backlogged and were catching up on reading manuscripts and that she promised I’d hear from them soon. After my initial disappointment, I thought “Now, that was really nice of them”. Usually, publishers don’t bother to call unless they want your work. Finally, one year after I submitted the manuscript, I got a call from the editor who told me that they wanted to publish my book! My heart leapt into my throat, I was so excited but I had to limit my exuberance because they had called me at work. I did tell my co-workers and allowed myself a few “woo-hoos”. And I did tell my husband who was my boyfriend at the time. My family lived overseas (my parents in Hong Kong and my sister in Australia) so I had to wait until I got home to tell them. SLH: How did you go about doing the research for Sacajawea Of The Shoshone? Was there anything different or interesting about getting the art for a historical type book? NY: There weren’t a whole lot of adult books on Sacajawea. Mostly, she gets a mention in books about Lewis and Clark. However, there were quite a few books about her in the juvenile section of the library, so I read about six books on her and browsed about a dozen websites. I found a really good Shoshone website that gave a very comprehensive overview of Sacajawea’s life plus interesting information like the meaning and spelling of her name. The internet is great for immediate access but you have to be careful about the information on there as there are a lot of misleading information out there, so I did a lot of cross-referencing with books. The publisher and art director are the ones who are responsible for the visual layout of the book including the illustrations. It’s one of the unique features of the Goosebottom Books books that they use a combination of real-life photographs and illustrations. For photographs, you have to get permission from the appropriate people and get permission to use the pictures, and all that was handled by the publisher. There is also one illustrator for each series so that the books in that series has a uniform look. 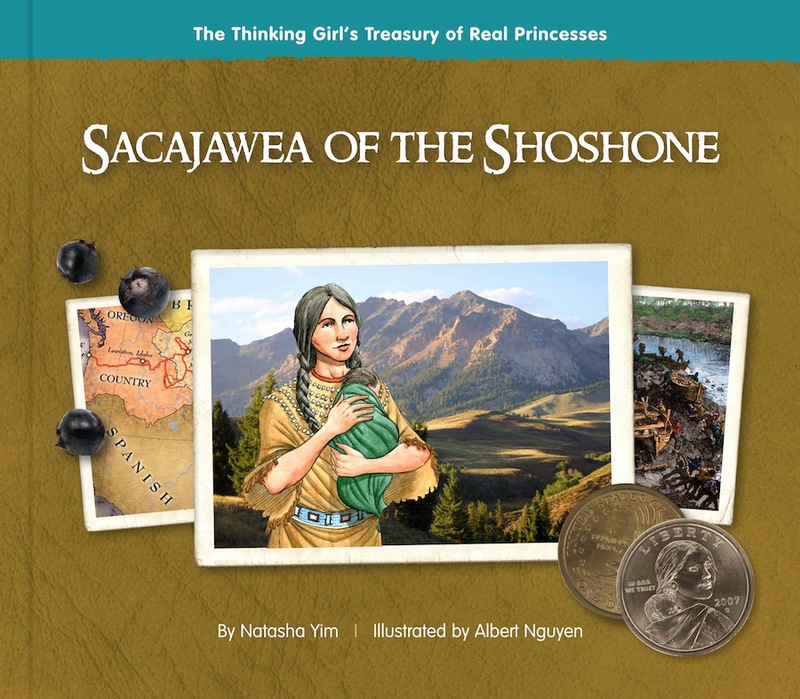 The Real Princesses series is illustrated by Albert Nguyen, so when Sacajawea was added, he naturally became the illustrator for this book. SLH: What surprised you the most when you were writing Sacajawea of the Shoshone? NY: Though Sacajawea has often been mistakenly labeled as the expedition’s “guide” and her name only comes up about 8 times in the Lewis and Clark journals, her presence on the trip was nonetheless invaluable and without her, the expedition could have failed at several points. Not only was she instrumental in providing food for the Corps of Discovery; she gathered edible plants and roots to supplement the game they hunted or in place of game if it was scarce, she patched up and made new moccasins for the men as they were continuously being ripped up by the rough terrain, she saved most of Lewis and Clark’s important instruments and documents when the boat in which she was riding almost capsized, she prevented other native tribes from attacking them because the presence of a woman and a baby indicated that the Corps was not a war party, and as the only Shoshone language speaker, she successfully negotiated for horses that helped the expedition cross the Rocky Mountains. Sacajawea’s contributions have left an indelible stamp on the history of the American West. Today, there are three mountains, two lakes, and twenty-three monuments named after her, yet her tribe, the Shoshone, are still fighting for Federal recognition. That, to me, is not only incredible, it’s outrageous! SLH: What has been the most challenging thing you have faced as an author/illustrator? NY: Everything about writing is hard. It’s hard work to make your story as perfect as possible before you send it out. It’s really hard getting the attention of someone who likes your story. If you’re lucky enough to be offered a contract and get your book published, getting it the attention it deserves and the marketing and promotion of it is challenging. But I think for me, the most challenging part was getting over my fear of public speaking and realizing this was something authors had to do. Only this year did I start to agree to assembly-type school visits but having done a few of those, it’s not as bad as I thought it would be, although all the ones I’ve done, I’ve done with another author. It might be a whole other level of anxiety if I have to do assemblies alone. SLH: Do you do school visits? Would you be kind enough to briefly describe your program/presentation? What is your preferred age range and group size? Do you have materials available for parents/teachers to go along with your books(s)? SLH: What advice do you have for authors/illustrators just starting out? SLH: Can you give us any hints about what you’re working on now? NY: I have a couple of middle grade/YA projects in the works and a picture book manuscript. SLH: Do you attend writer’s conferences? Enter contests? NY: Yes. I’ m a conference junkie. I LOVE writing conferences because I always learn so much and I get to network with other writers. I rarely enter contests though just because I don’t really have the time. SLH: Any marketing tips? What have you done that has worked well? NY: This is in line with a recent question I received on my blog from Amanda J. Harrington who asked, “What is your best marketing strategy for building up a following on line?” I promised to provide a link to whoever posted a question on one of my blog tours. So, here it is: www.thewishatree.com. Please hop over and check out Amanda’s site. 1) When I first started my blog, I posted things about my writing life, my home life, how I juggled that with writing, any meagre successes I encountered. But here’s the thing: nobody wants to hear or read about you talking about yourself all of the time. My blog began to feel…well…a little self-absorbed. So, I started incorporating things that I think might be of interest or useful to other people, especially writers, such as interesting writing conferences or retreats, writing tips I’ve gleaned from other sites or articles I’ve read. And now I’ve included a Friday Features segment on my blog that is purely devoted to interviews with other authors. It’s been great fun and I’ve learned so much from the authors I’ve interviewed. Come check out interviews with Deborah Halverson, Linda Joy Singleton, and coming up soon, Gennifer Choldenko (www.writerslife2.blogspot.com). 3) Comment on other people’s blogs or Facebook postings etc. Don’t make it all about you. Congratulate others on their successes, ‘like’ the posts you enjoyed, exchange information. The key word in social networking is “social”. 4) I have a Facebook fan page for Cixi, The Dragon Empress and Sacajawea of the Shoshone. In addition to posting events and book information, I’ll post interesting tidbits about the characters—Cixi’s six inch long fingernails, for example, or a video of the Shoshone Love song on Sacajawea’s page. It makes the pages more fun and interesting. I don’t know how much of a “following” I have, but my blog has seen an increase of about 4,000 page views since January when I focused on making it more interactive and informative. SLH: Where can we find you? Plotter or pantser? A converted Plotter. I used to be a pantser, but now I like having some sort of road map to go by. Natasha, thank you so much for joining us and being so helpful with all your answers! Thanks for the great interview, Susanna and Natasha! Great interview! I'm looking forward to reading your book, Natasha. How about this for an article: Nodding and Other Techniques to Make Your Travel Companions Think They Are Really in Charge. OMG Katie! That is a good one! You totally made me laugh 🙂 Thanks for joining in the fun, and glad you enjoyed the interview! Thanks, Katie! That is awesome. I can see how well that would have gone with Lewis and Clark! Great idea, Larissa. Many Native American tribes at the time valued blue beads. At one point, Lewis really wanted this otter skin robe one of the Indian tribes had but the Corps had already traded all their blue beads away. Sacajawea had a blue-beaded belt which must have been extremely valuable to her. She offered it up so that Lewis could have his robe—another example of the many selfless acts she committed. Thanks for stopping by, Diane. What a fun article idea! Of course not, we're in America. Gotta have our nuggets! Natasha! HOW I LOVE YOU!?! What a wonderful interview! I loved the fact that she was only mentioned in eight journal entries! So interesting! Thank you so much for mentioning my blog! What a HUGE compliment. =) Wowza. Thanks for the wonderful post ladies! Elizabeth…Rob and I are CRYING right now at your journal entry names!!!! Hysterical. Susanna, I cannot be creative this late at night, just wanted to stop by and say how lovely Natasha is and what a great interview this is! AND, I think you need to give a prize for the best Sacajawea journal entry name. Reading these comments has been SO entertaining! Thanks for stopping by, Amy! The Sacajawea advice column has been the best idea and what a creative lot we writers are! The entries have been supremely fun AND funny. So glad you stopped by Elizabeth. I'll be preparing some fun. interesting, juicy tidbits that did not get into the book for your blog tour stop, some of them I've mentioned in my replies here. So be forwarned everyone—more Sacajawea and Lewis and Clark facts to make you laugh, cry and scratch your head…they did what? Coming up: Oct. 23 on the Banana Peelin' blog: http://bananapeelin.blogspot.com. By the way, you are hilarious! What to Expect When You're Exploring…with White Men? That's a hoot! Very interesting interview. Thanks for all the concrete marketing ideas, Natasha. My Sacajawea article: Ten Subtle Ways to Get Men to Ask for Directions. This is an awesome interview. Susanna, you said it was long…but I enjoyed every bit of it! I loved learning more about Natasha and Sacajawea. Can't wait for your post Natasha! I have loved all of the suggestions listed here. Too fun! 1. New uses for old bones: How to make combs, toothpicks, games, saddles and more! Great article ideas, Sidney! Love the “New uses for old bones”. Brilliant! Thanks so much for stopping by, Penny! I would sooo read that article. Ever heard this one: “I don't NEED to ask for directions!”? I thoroughly enjoyed reading the post about Natasha. The advice she offered for marketing was invaluable. When I started blogging, I too wrote about writing, what else did I have to say! But Natasha is right, to keep readers we have to offer something of interest which hopefully will attract new readers. So thank you, Susanna and Natasha. Now, I still have to sign up on all those other social sites. Yikes! Hi! This is Natasha's sister. 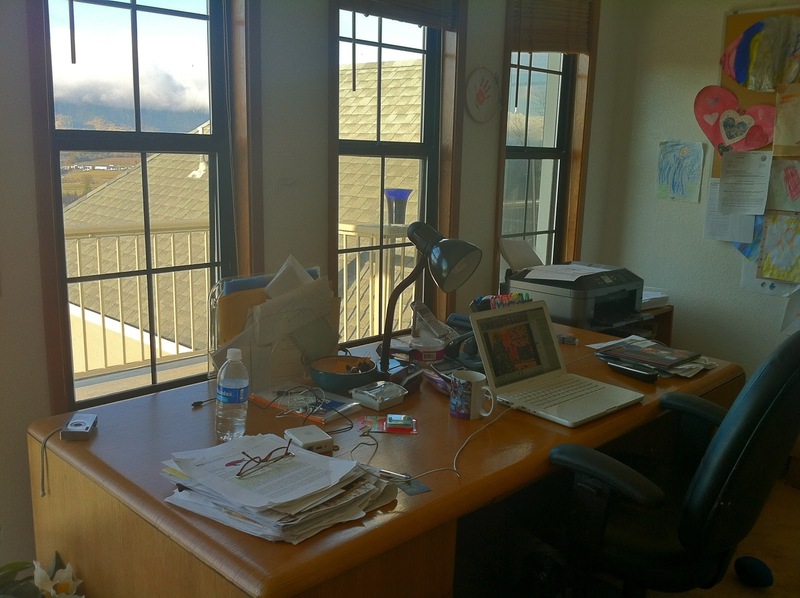 I just wanted Susanna to know that the pic of Natasha's desk is a lot neater than…Natasha's desk! Ha ha. Great blog, ladies. Thank you both. Thanks for the great and inspiring interview, ladies. So glad you found it interesting and helpful, Tracy! Thanks for stopping by, Stina! Yes, thanks a lot, Shirin. I will return that favor some day. Ha. So article by Sacajawea? MMM . . . To Eat or Not to Eat: 101 plants to avoid in cooking. Thanks for your kind words, Janet, and I'm glad you enjoyed Natasha's interview. Her advice is helpful, and you'll be doing school visits and marketing before you know it 🙂 Excellent article idea! Glad you could stop by Janet, and great article idea, considering how many poisonous plants one could run into out in the wilderness.